Where will the kids play? I have had to find alternatives to how I garden with having a toddler around. However, let me start from the beginning. My thoughts at the time were that food was going to be a priority and there was always a park down the road we could use. Isn’t that what the park was there for? I can currently say that I have not regretted getting rid of the lawn and our toddler is too involved with collecting chook eggs, feeding snails to the Koi, looking at bugs and picking strawberries or chasing butterflies to question me about where the swing is or even where a swing should be going. 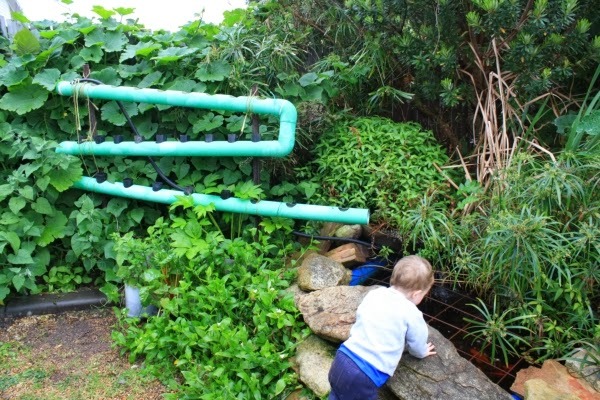 The pond is a point of fascination in the garden and is childproofed (and cat proofed) by weld mesh and aquatic plants. I think that now in – in retrospect – I can say we made the right decision. Our little one has a sandpit on the deck that he plays in from time to time and the rest of the time we get out and visit not just one park, but all the different ones in the area. So the garden has been able to fulfill its many roles of nourishing, educating and delighting our youngster. This has, as you may imagine, created some challenges for me. How do you prevent a toddler that is so interested in the garden from picking unripe tomatoes or prized flower heads or immature berries? Let alone protecting prize plants whose main purpose is to provide a good crop of seeds for seed saving endeavors. I have come up with some solutions. I guess its more barrier protection techniques really. Getting plants out of reach where they are going to be able to survive, but still be seen. Pots of seedlings protected from small garden people. For big garden people to have access the white tub is removed – or stepped over, depending on their bigness. So, here are some ideas that you may find beneficial for your garden and are also space-saving in their approach. I delight in something that is practical and multi-purpose, so here are some ideas to share. Strawberries go aerial. This allows for me to keep the delectable berries easily reachable for me and out of reach of our toddler. He did try to stand in the containers underneath to reach the berries ( who wouldn’t!) but a little talking to and a couple of smaller containers in front of them created an easy solution. 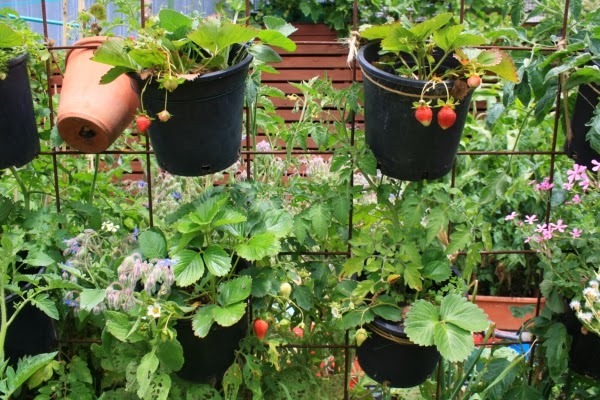 The strawberries also get the sun they need and are well drained. In watering them I also end up watering the containers underneath, so it’s also a time saver in some ways. Strawberries get all the sun and attention from family members they could want. Trellised barriers. I use these effectively to protect not just some of the plants growing in containers but also to start seeds in pots without them being interfered with. 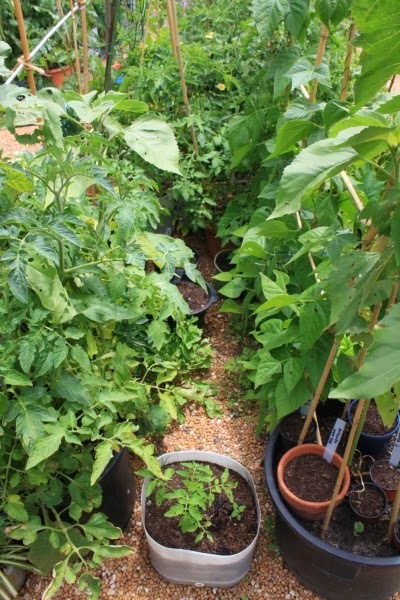 It also fits a lot of plants and seedlings in to an easily watered space which then becomes a micro-climate within itself. Seed raising on the chicken coop. A bit inconvenient at this time of the year as the seed trays dry out very quickly but a good use of a space otherwise left bare. Plus a morning watering of the seed trays keeps the coop cool during hot days. I also use hanging baskets to make use of ‘air space’ and these are well out of reach a little hands. I have two window boxes of bush beans hanging on the back garden bed entrance so that it deters our toddler from getting up onto the back bed. He seems to have lost interest. It helps having the chickens close by as a distraction too. When it comes down to it I am prepared for surprises as our toddler finds ingenious methods which means I have to lift my game as well. I have had a few casualties and I grow a heap of cape gooseberries to keep him interested in also. These he can freely pick as he wishes, ripe or unripe. Sometimes he picks green ones to fed to the fish. I haven’t lost any fish from this.